- Publisher To the contemporary mind, the Old Testament books of the prophets often seem obscure, sometimes even harsh or lurid. But this new book by John Eaton sets out to see the Hebrew prophets with fresh wonder. Rather than giving a one-dimensional, historical study of these inspiring figures, Eaton presents each of the Hebrew prophets in relation to his own liturgical tradition, to the religious intermediaries of other peoples, and to the great poets of all times. 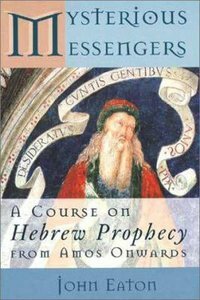 About "Mysterious Messengers: Hebrew Prophecy"
To the contemporary mind, the Old Testament books of the prophets often seem obscure, sometimes even harsh or lurid. But this new book by John Eaton sets out to see the Hebrew prophets with fresh wonder. Rather than giving a one-dimensional, historical study of these inspiring figures, Eaton presents each of the Hebrew prophets in relation to his own liturgical tradition, to the religious intermediaries of other peoples, and to the great poets of all times.